Welcome to our day of winners announcement, the last day of the month is the day to announce the winners of all the events during the month. Today we will be announcing Spring & Summer Coffee Lovers Blog Hop winner and June Challenge winner. Donna and Kathy please sent an email to sales@joyclair.com to claim your $25.00 gift card from Joy Clair Store. Include on the subject the name of the event that you won and June Winner. See you tomorrow with a lot of inspiration in our June Challenge! These two stamp sets have become my favorite of the release so far! I can see so many possibilities using the Brick Background and The Potter. I LOVE pottery so this set is a must have for me! I stamped the sentiment then masked it off with a circle die and ink the top part of the card panel in Distress Inks in yellows and browns. I removed the masks and then I stamped the jars of clay in Versafine Clair Nocturne Ink on the card and on a piece of post-it note for a mask. Then I used the brick stamp with the Versafine Ink to stamp the bottom portion of the card panel. Versafine Ink is amazing because it only takes one time to stamp an extremely dark and crisp image. It has become my "go to" ink for almost all my stamping these days because I can use either alcohol markers or watercolor markers to color the images once they dry. I inked the bricks with Distress Inks in reds and browns to give it some shading. I like how the sentiment really pops out because of the partial white background. I cut the panel down a little and then added some "Trust In God" washi tape on the bottom of the card base. I cut the main panel down and adhered it to the card base. I colored the jars with various Copic and Spectrum Noir alcohol markers until I was happy with the look. I love how you can use both watercolors and alcohol markers with the amazing Versafine Clair ink and how crisp it stamps! 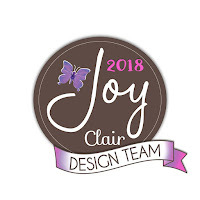 Hello there Joy Clair friends! It's Kerry here and I've got a fun sparkly card to share today. I love sparkle, glitter, sequins and anything blingy so the new stamp set Born to Sparkle makes me just smile! I love the fun fonts and the mix of sentiments and love, love, love the fun mix of sequins. Did you know you can create your own sequin mix just by stamping them and adding a bit of gloss and sparkle glitter? YEP! I did and I'll show you how too! To start off my project, I used some Nuvo Shimmer powder to create a fun background on white cardstock. This powder is shimmery and works perfectly with this set! After adding some spritzes with water (to allow the powder to bloom), I dried it with my heat gun. Then I diecut it so that it would have a fun border (the die is from Fun Stampers Journey). After I did that, I set it aside and stamped some sequins. The sequins were stamped with Memento Tuxedo Black ink then colored with my Copic Markers. I added some glaze then sprinkled some microfine glitter onto the sequins and set them aside to dry. Look at these little sequins! Aren't they fun? After they were dry, I punched the little hole into the center of each sequin and then cut them out. I had a collection of fun sequins for my card! WOO! I mounted the background paper on some gray cardstock then added some sparkly washi tape. I tied some black twine, (and silver sequin trim) to the card then added the sequins. I stamped the sentiment with the perfectly matching VersaFine Clair Charming Pink Ink. I love these inks and how they provide such crisp images every time! Oh, and see those twinkle bursts? I stamped those with Versafine Onyx Black ink and applied a bit of silver glitter embossing powder from Hero Arts so that they could shine! Hi! Jenny from Jen's Crafty Place here with a clean and simple card using the new stamp set by Joy Clair called, "God's Masterpiece". You can find this stamp set and a lot more from this new release HERE. Pick any size card base. I used an A2 but you can do this with any size, 4x6, 5x7 or the one I did 4.25 x5.5. Cut out the inside frame and add your favorite person or pet in the opening you made. For the fun part, stamp the paint splotches from the set all over the card front using your favorite colors. I used a lot of brights for my pallet. Get creative and play with color for different looks. Color the letter's in the word, GOD'S with colored pencil to match my stamping. To add some dimension and some shine, I added some Glossy Accents over my splotches. Set aside to dry. I hope you like my card! Give it a try! For more inspiration go to my blog at Jen's Crafty Place and subscribe to my newsletter so you don't miss a single idea! I had an idea for creating a bokeh effect in my Bible and have just been waiting for the right set to come along to pair it with. This past month, Joy Clair had their new release and in that release a stamp set called "Many Names" was released and I knew it was the set to pair with this technique! I have to say that this page is inspired by a journaling page that Andie Bjork, who is on the Joy Clair Design Team. Her page is different, but she creates a cluster with this stamp set as well. Check out her page HERE!! And if you want to see how I create this two page Bible Journaling layout with the new Many Names stamp set, you can watch the full video tutorial down below!! I started these pages with the stamping and for my ink I am using the brand new Versafine Clair ink in Nocturne. This ink works soo well in my Bible. It is a pigment ink so you can heat emboss, with it, but I just stamped with it and it is rich in color and is incredibly crisp. It's not quite as wet as my Versafine Onyx Black ink so it's not near as messy, but stamps just as crisp, so it has all the benefits without the set backs and easy smearing! I stamped my cluster of names on the right page and didn't quite go to the edges - I would fill those in later on. This technique and page could be replicated on any blank page in your Bible, but I am working on the first pages in the Old Testament. I did outline, with a micron pen, around the Old Testament words so I wouldn't lose those in the cluster I created. For the bokeh technique, I am using circle dies in different sizes (a nesting set works awesome or you can possibly use punches if they're nice and sharp), tissue paper in three different colors, and matte gel medium. If you do not have matte gel medium you can use any collage medium or gesso might work as well, just make sure whatever you are using will glue, seal and dry clear. I die cut several sizes of circles from the tissue paper - I used purple, blue and gray for my colors. After die cutting, I started gluing down the circles making sure there was no white space left behind and overlapping some of the circles. I started with the largest and worked my way down to the smallest as my white space began to disappear. Be sure to watch the video tutorial above, this technique is a lot to see in action than explain! After I finished gluing my circles I gave the pages one last coat of gel medium to seal everything in and then let this dry overnight. The next day when everything was dry, I carefully cut around the edges of the pages with scissors to make the edges nice and clean. The pages will be a little curly and not flat at all. I just shut my Bible and let the pressure of the closed book flatten the pages again. And it was that simple! This technique does take a little time, but it is well worth the final result! I am in love with this technique and can't wait to try it out on cards with different colors. Even a rainbow would be gorgeous on a card with a nice bold sentiment! If you do try this technique, be sure to tag Joy Clair stamps so we can see your gorgeous creations!! If you are interested in any of the supplies or are curious about what exactly gel medium is, I have linked a few options down below! Thanks for spending a bit of time with me today and Happy Crafting!! Hello Friends! I am excited to be on the Joy Clair Blog today using two of the newest stamp sets: Crackle Background and The Potter. I used VersaFine Clair Waterproof Pigment Ink for my stamping. I choose to work on a page in my Hymnal - "Have Thine Own Way, Lord." The lyrics of this meaningful hymn are perfect for The Potter set. "Thou art the Potter, I am the clay." This set has 7 stamps and is very versatile for cards, journaling and many other fun projects! To begin with I used the Crackle Background with gold stamp ink on certain parts of the hymnal page to give it an aged and vintage look. I then stamped out a few sets of the pottery on cardstock using the VersaFine Ink. I am very pleased with the quality of the ink - comes out very clear, works well with the stamps and is very easy to clean up! It also got all of the details on the stamp! I used Prima Tropical Watercolors to paint the vases with a water brush. I also love to make big tabs on my pages so I stamped one of the stamp images on cardstock and cut it out for placement on the top of the page. I used the Scripture stamps on the page along with some black alpha stickers to say "Mold Me." I also placed the stamp of the woman being carved near the bottom of the page. What a beautiful image to show how God will prune us, grow us, and mold us into what He designed us to be! He is the Potter! I took the watercolored vases and attached them to the bottom of the page with a glue stick. I hope you enjoyed this project and will find many uses for both of these stamp sets on your own! Hello everyone! Martha Lucia here with you! Today I am featuring the Many Names stamp set from Joy Clair. It is part of the Color by Faith Collection that can be used on cards or bible journaling. I started by arrange the image over a decorated paper layer. The size of this is 4"x5-1/4". I inked all the images with VersaFine Clair Nocturne on my stamparatus and stamped all at the same time. Then I embossed the complete layer with clear embossing powder. I cut a card base on So Saffron cardstock and pasted a Wisteria Wonder layer directly over the card base. I also pasted the stamped layer and prepared a mix of Fireworks to coloring some details of the names. I used Fireworks in two colors, Lilac Posies and Bahama Blue. I applied the colors with a paint brush. To decorate the card I cut a circle in watercolor paper using one of the dies from Circle Collection and then I stamped one of the names included on the stamp set Many Names over a piece of watercolor paper using VersaMagic Cloud White and white embossing powder. I mixed the same two colors of fireworks with Ink Potion No. 9 and damp the embossed image over the mix to have a complete coverage of the circle. Using the same collection of circle die cuts and cardstock I created the mats for the stamped image and pasted it with dimensional over the card. Also, I added some gold sequins with On Point Glue and finalized the card. It' Donna here with Joy Clair and the whole month of June we are collaborating with Imagine! I am so excited to be collaborating with them and have the opportunity to work with their products! Today I'm using Life's a Breeze from the new Joy Clair release. I love the images in this set and that you get two sizes of the kites is great! I like how simple this card was to put together. Even though the bottom layer is busy, coloring in the top panel only gives a nice focal point. I started by adding my smaller images to a block. I stamped the three small kite images and sun with VersaFine turning my block around to change where the images stamped. Then I layered my stamped back ground on a black cardbase. Then I stamped a large kite on a smaller panel and created a scene using the sun from Life's a Breeze and the clouds from Get Well Wishes. I then colored my kite and the sun with Copics after the VersaFine was dry. Layered the small panel on some black cardstock before adhering to my cardbase. I've also been playing with some VersaFine Clair inks. I decided to see how they stamped on a cork coaster. I grabbed another Joy Clair set Inspirational Arrows and stamped them using Warm Breeze, Green Oasis and Morning Mist. I love how the colors look on the cork. I tried to use Verdant, but the color didn't show well enough so I stamped it again with the darker green. I will mention I haven't tried using this coaster to much yet. After a couple of hours I did set a water bottle on it with no bleeding. I still want to see how it handle a glass of ice water once it starts sweating to see if there are any problems. If it works well, I plan to stamp more of these cork coasters in the future! It's Ceal, here to share with you today. This month we are collaborating with Imagine Crafts who are the makers of the new Versafine Clair inks. These inks are so amazing! Because I love ink blending decided to give them a try at it, and they passed with flying colors. If you have never ink blended before I will give you a little tutorial on it using these inks but the steps go for any inks you may have. First you select your cardstock panel, you can use any cardstock but I find that most inks blend really well on Bristol Smooth. If you have never heard of it, you can find it any hobby/art supply store. Next you want to lay your panel on a piece of scrap paper or a craft mat so you do not get ink everywhere. You can either use a sponge, a makeup application sponge or a blending tool. I used the round blending tool by Tim Holtz. Next you would ink up your tool and then blot it off so that its not heavily loaded with ink. Always use circular motions and always start off of your panel then work your way on to it, this prevents harsh lines. And it's as easy as that. I love the way these inks blended. Now for the deets on how I created my card. I started with a white top folding card base and a panel of bristol smooth cut down with a stitched die. Using the MISTI I placed the gems from the set Born to Sparkle in the order I wanted then picked them up with the lid and inked them up with Versamark ink and then embossed them with Ranger Bridal Tinsel embossing powder for sparkle. I used Versafine Clair ink in two different blues, Paradise and Blue Belle and blended them together to create a dreamy blue background. To finish the card I added a sentiment also from the Born to Sparkle set and stamped it with VersaFine Clair Nocturne (which is my new favorite black ink) and then embossed it with clear embossing powder.